Wally Waddlewater has written a card and wants to mail it. 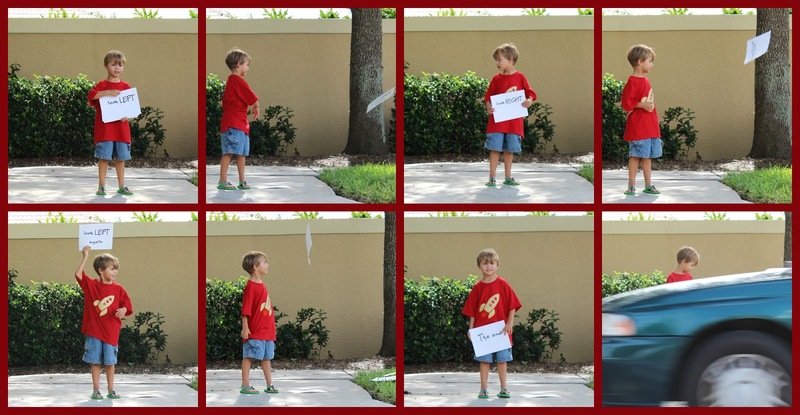 To mail the card Wally has to cross busy streets and his Mama has to help him learn how to do so. On the way to the mailbox they maneuver their way through many street crossing scenarios and challenges. 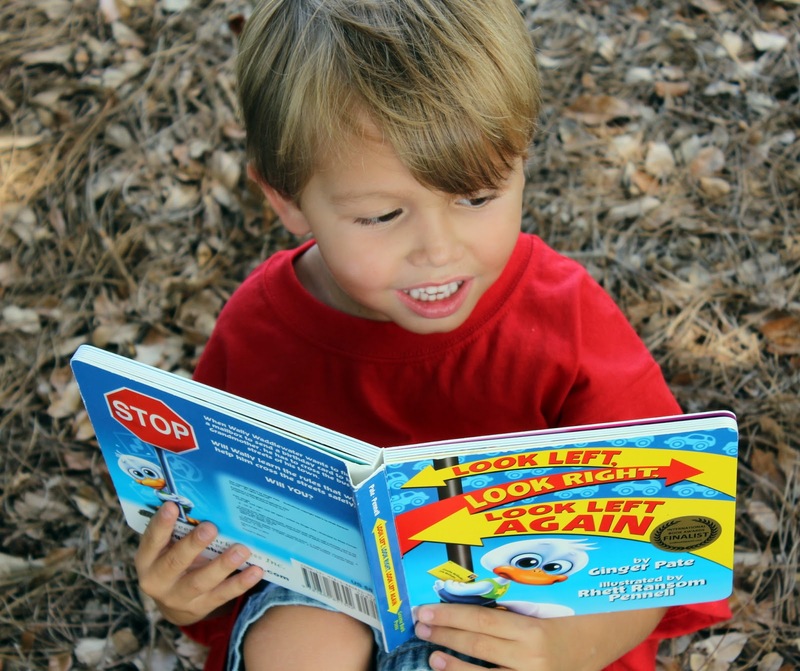 Look Left, Look Right, Look Left Again published by Greene Bark Press tells the tale of Wally learning how to properly cross the street, one of those basic super valuable lessons every child needs to learn. 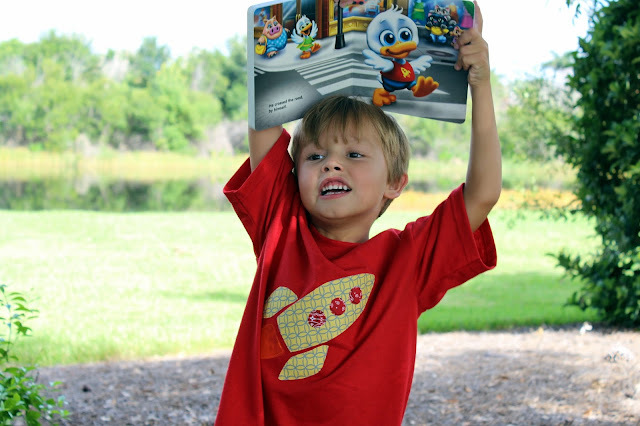 River, a book fanatic, was excited when we were chosen to do this review. The hard-cover board book is geared toward preschoolers and uses a simple, easy to remember jingle to teach kids the rules of crossing the street. River (age 4) really enjoyed this book. I knew we were both hooked when he giggled hysterically the first few times I said "Waddlewater". 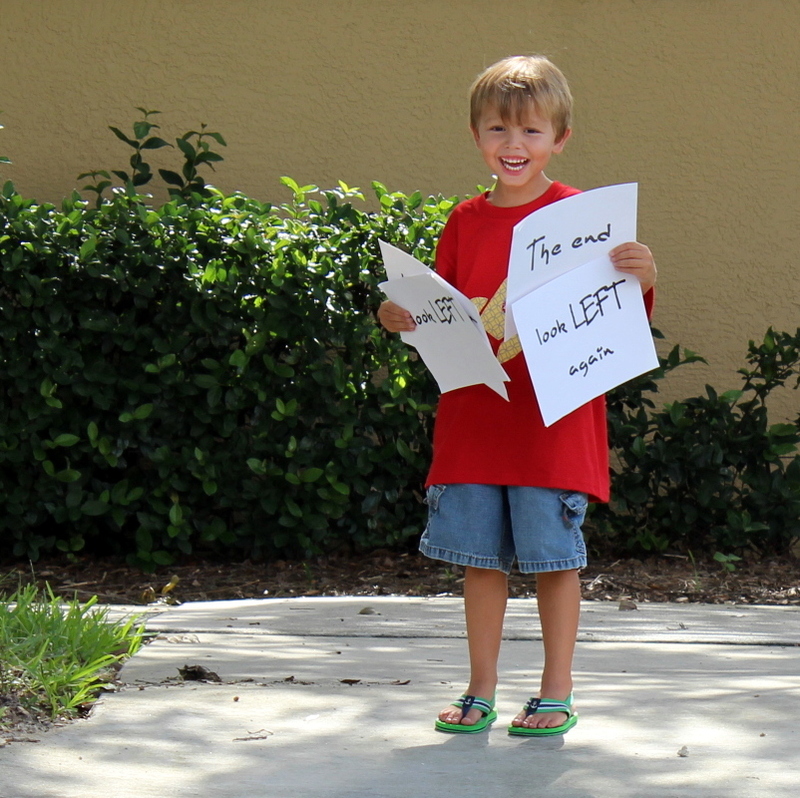 The book makes it very clear in a fun, creative way why it's important to "look left, look right, make sure everything is out of sight, then look left again" and the message sticks. 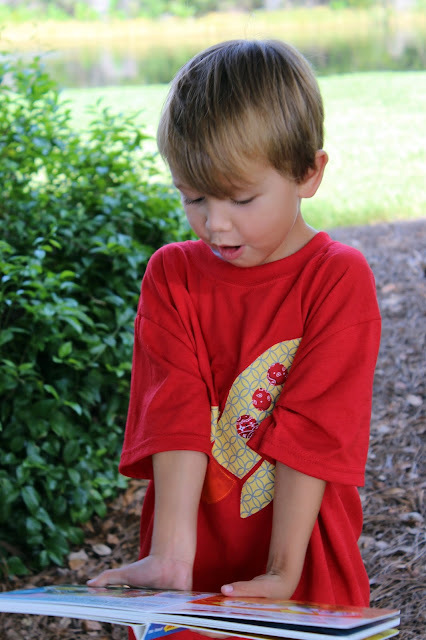 We were leaving the library one day and River asked, "Mommy, why didn't we look left, look right, look left again?" Well I had looked myself, but River didn't know that. Of course, we backed up and practiced. Since then, we've been practicing everywhere. An added bonus of the book was that it helped reinforce left and right. Second added bonus - lots of words are repeated page after page, great reinforcement for early reading and word recognition. River's review: "I liked reading it. I learned about crossing the road. Other kids should buy the book, but I don't want to give mine away." 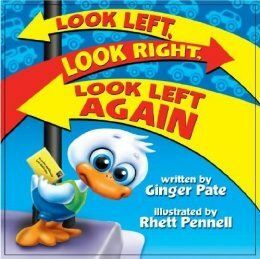 Look Left, Look Right, Look Left Again is available at GreeneBark Press for $8.50 and is geared toward 3-8 year olds. River and I were both very impressed with this book and recommend it. For fun I made River a rocket shirt that matches Wally's (but it's not exactly the same because the rocket on Wally's shirt only has two windows, River asked me to make that very clear). 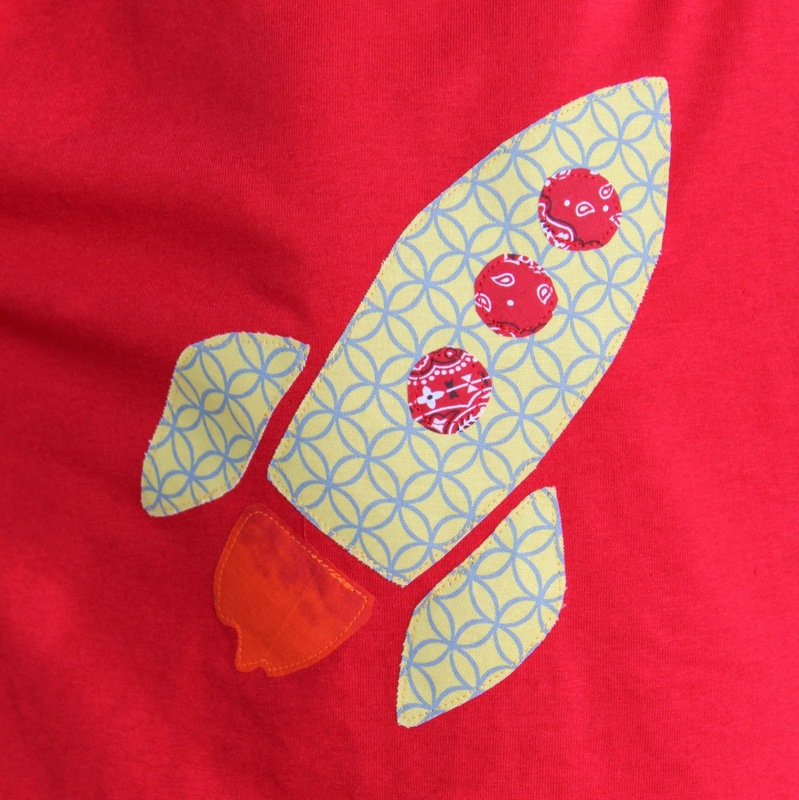 Heat and Bond (regular, not ultra) adhered the fabric to the t-shirt, I then stitched around the edges with a straight stitch. Simple project and one that River absolutely loves.